In the town of Longyearbyen, on the remote Arctic island of Spitsbergen, one rarely goes more than a day without hearing the boast “world’s northernmost”. 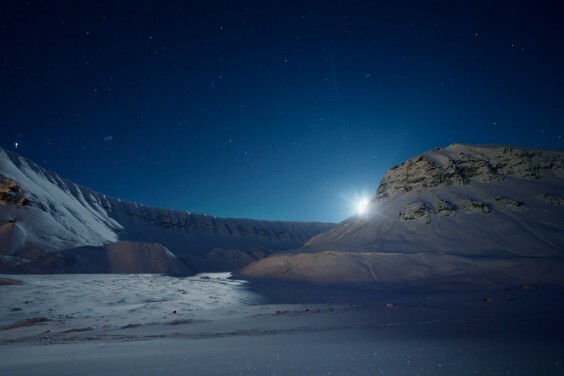 Whether it’s said of a post office, swimming pool or petrol station, one is always confronted with that word, “world’s”, as if Longyearbyen were another of those midwestern towns that cling to their claims on the world’s largest Ukrainian easter egg or world’s tallest thermometer like titles alone would be enough to convince the rivers of interstate warriors passing through to stop and spend some out-of-state dollars. 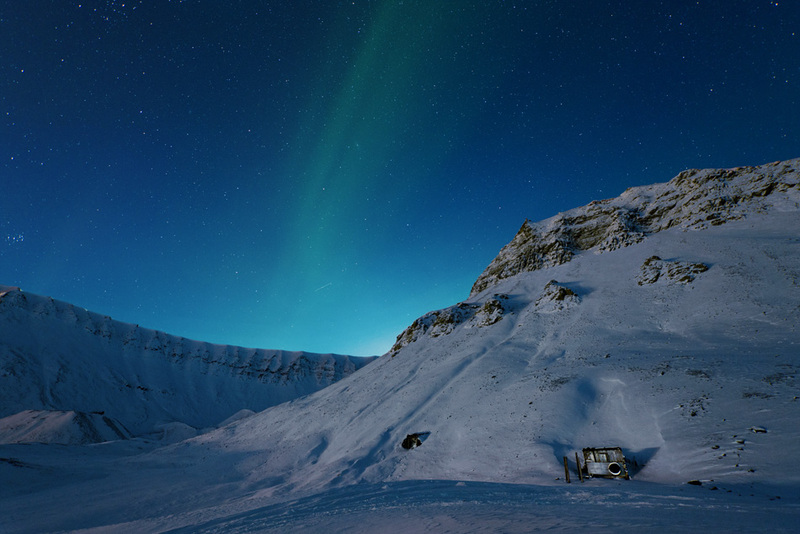 Hang a right out of the world’s northernmost supermarket, past the tinsel-strewn pine tree imported from the mainland (the world’s northernmost Christmas tree, natch), and it’s either a coffee at the world’s northernmost cafe or a pint a little further down the road at the world’s northernmost pub. 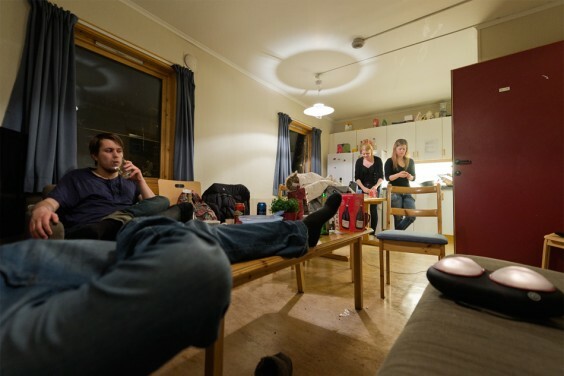 In the nearby student village of Nybyen, we would joke that each morning’s breakfast featured the world’s northernmost egg being fried up “at that moment”, or that the roomful of students gathered to watch Norwegian state television on November 4th constituted the world’s northernmost Obama victory party. But the jokes, tiresome as they may grow (and difficult to verify as they may be), underscore a very real part of life on the Svalbard archipelago. 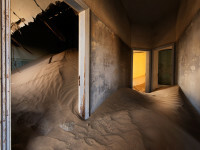 No matter the situation, isolation is a defining feature here. 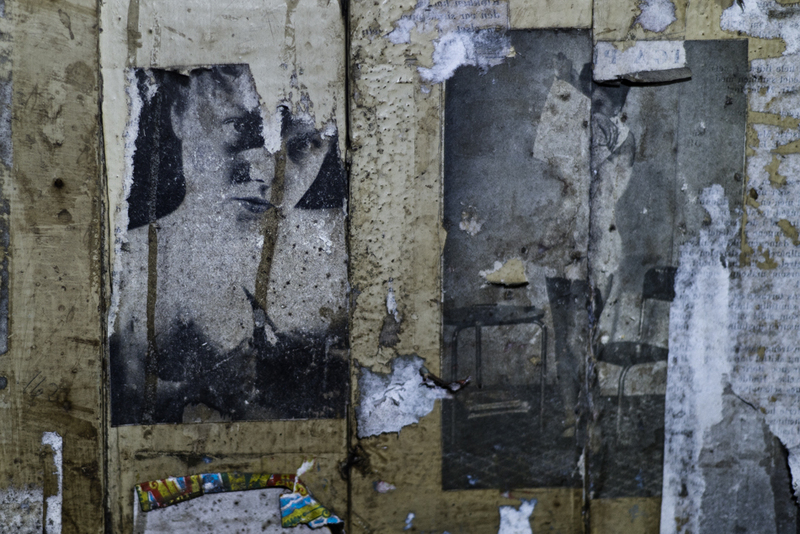 For some, particularly those who, like myself, are just here for short stays, it’s part of the attraction. 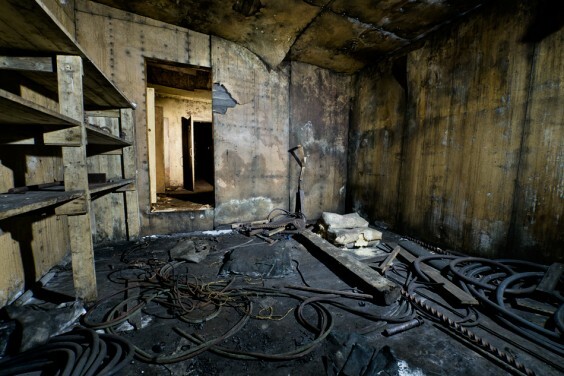 For others, shacked up in the company mining towns of Svea or Barentsburg on two year contracts away from friends and family, it’s a demon to be confronted with whatever substances may be on hand. 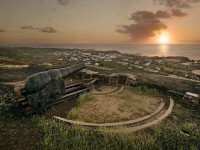 The demon cosies up closer between late October and early February, when night blankets the island, and for fourteen weeks the sun has gone south for the season. Windscape: High winds mould a fresh snowfall into a protective crust over the permafrost. 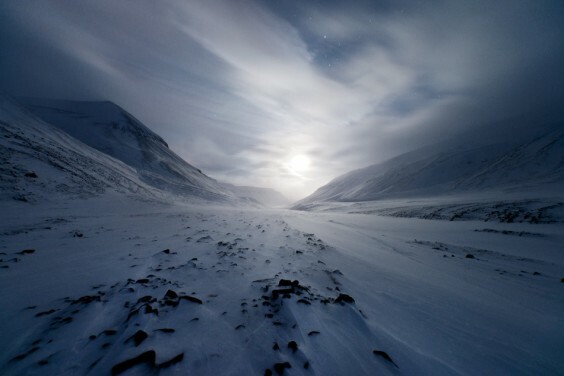 Seen here shortly after noon, the moon is the brightest (and, outside periods of high auroral activity, indeed the only) source of light on Svalbard from mid-November until late January, when twilight again reclaims the middle hours of the day. 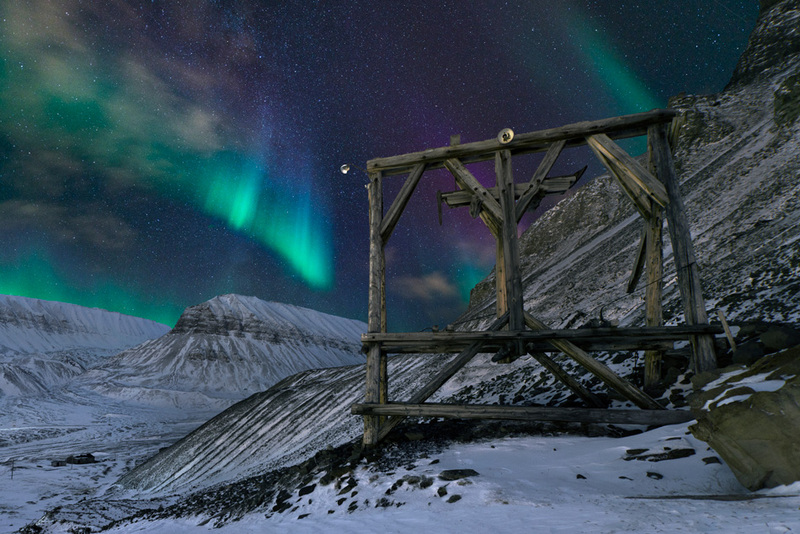 Lightscape: Aurora dance over the wooden carcass of an old mining tramway at the southern end of Longyearbyen. 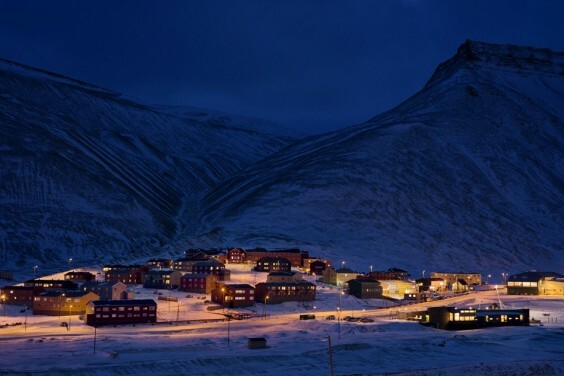 With a population of 2000, Longyearbyen is the only sizable pocket of humanity for 1000km in any direction, including north, where it's the last civilian settlement of any sort before the North Pole. 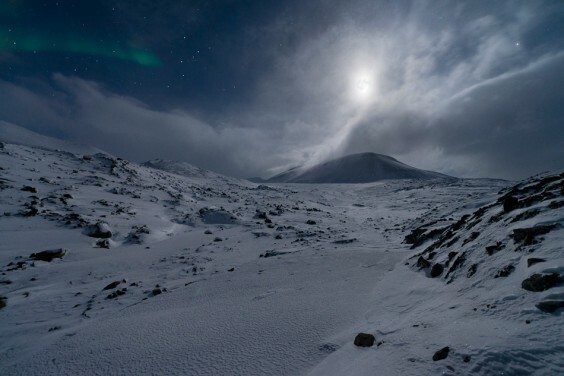 Icescape: A windstorm whips up snow on a distant mountain across the long plateau that separates Spitsbergen's Endalen and Fardalen valleys. 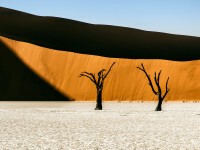 Funnelled by barren, treeless valleys, high winds can quickly turn into gales. Twilicked: Silhouetted in twilight's mid-November remnants, UNIS students Harry and Eli joke atop a glacier. 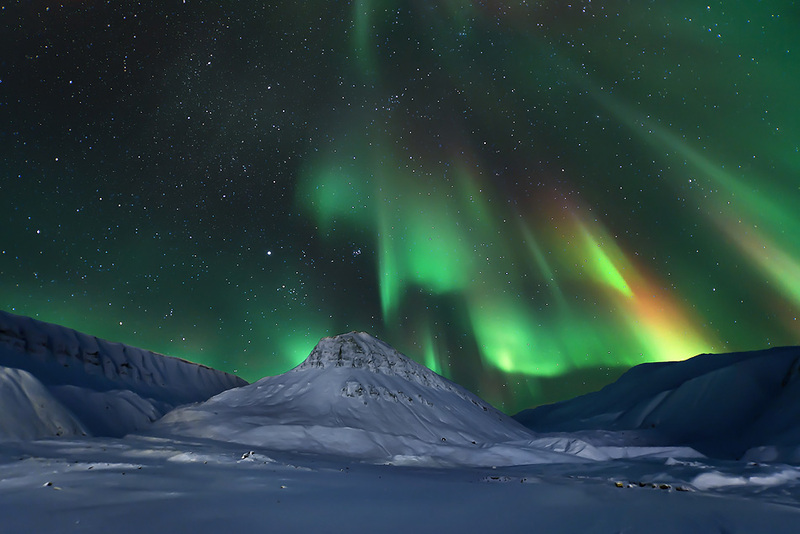 Slow Motion Fireworks: Aurora light up the sky over Sarkofagen south of Longyearbyen. 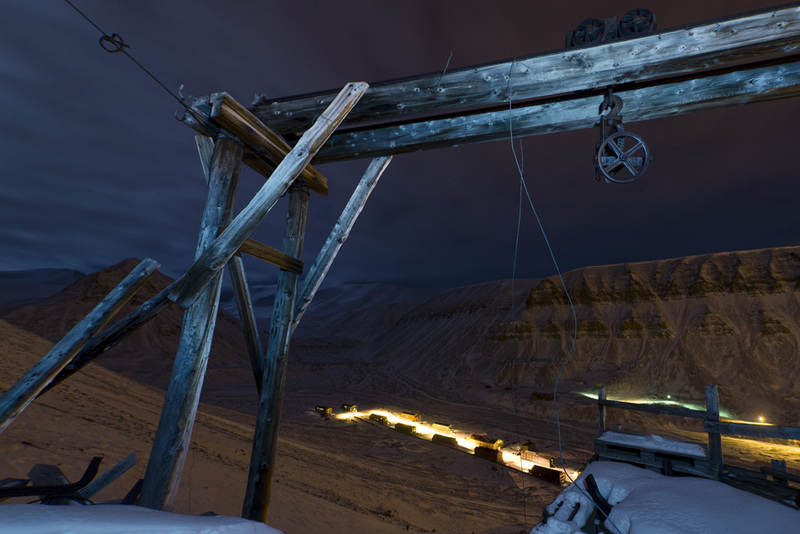 Tapped Out: Entrances to the former Mine 4, sealed shut by of decades of multiyear ice, puncture the seams of coal-rich Sarkofagen. 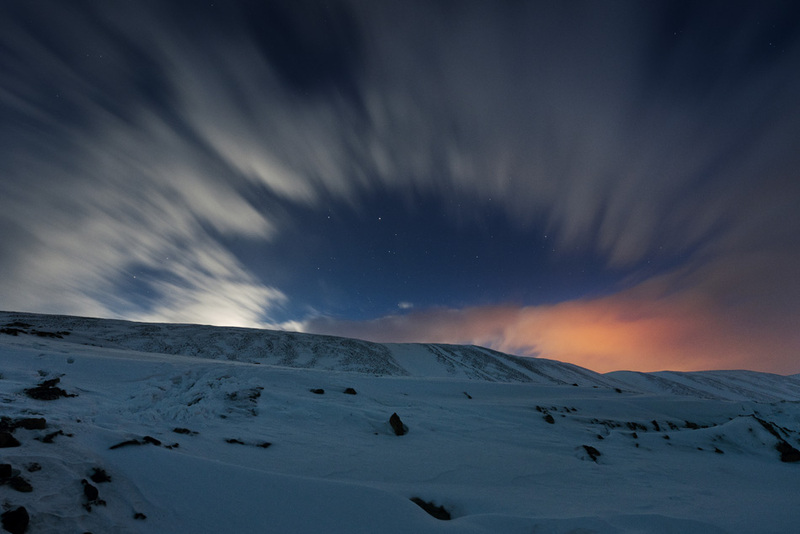 The Amber Compass: Viewed from two valleys and 10km away, the lights of Longyearbyen compete with cloud-reflected moonlight for real estate in the sky. City Mount, Country Mount: The reflected lights of Longyearbyen end abruptly at the moonlit mouth of Larsdalen, a 3km-long valley winding up to the Lars glacier and the 810m peak of Trollsteinen beyond. Here, as with everywhere outside the perimeter of the settlement's tungsten glow, expeditions must carry a rifle to combat the very real threat of polar bears. 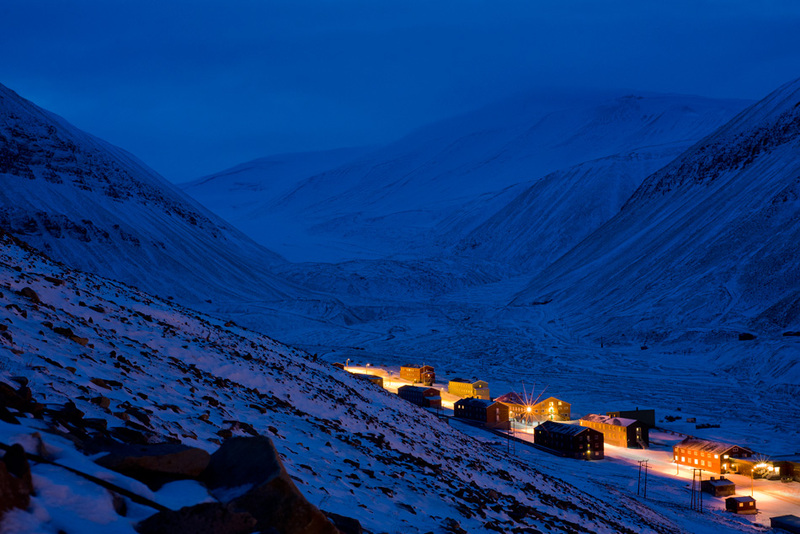 Orange's Diagonal Incursion: Seen here during early November's 1pm twilight, a row of former miner's barracks, six of which now house the island's student population, comprise the main and only drag of Nybyen ("New Town"), 2km from Longyearbyen. Beers in Barrack 10: Late night drinks in the UNIS dorms. 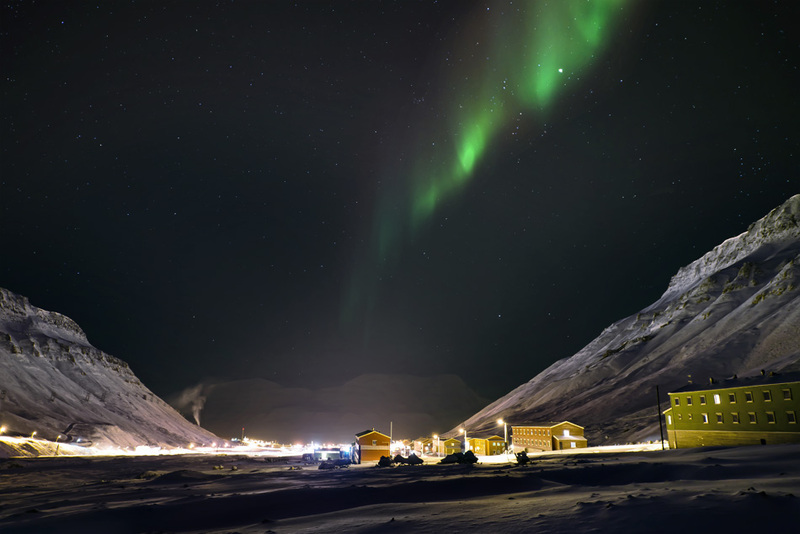 Sequestered away in nearby Nybyen, roughly 10% of Longyearbyen's population at any given time consist of students enrolled at the University Centre Svalbard, a joint venture of four mainland universities. 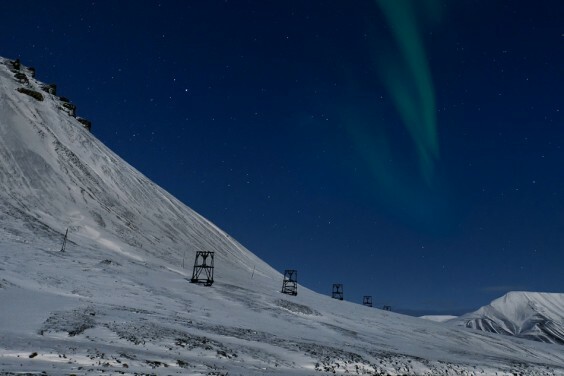 Hailing from science programs in Norway, Russia or further afield, students generally visit Svalbard for one or two semesters of Arctic studies. Labwork: UNIS marine biology masters student Ida Helene prepares samples of clione limacina, a little-researched pteropod found in Arctic waters, for genetical testing in a campus lab. Hymns for Winter's Longest Night: Svalbard's amateur mixed choir performs for the community during an arts festival marking the year's last atmospheric twilight and the beginning of the polar night. 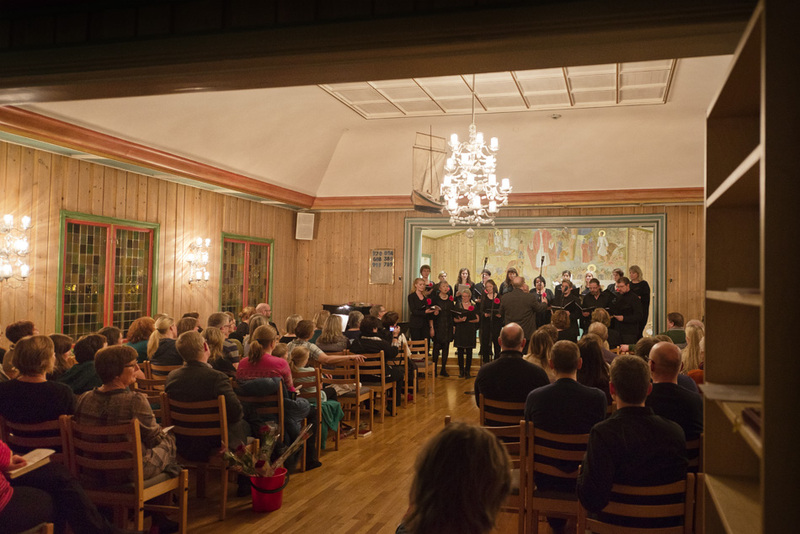 With the closure of the nearby Russian mining town of Pyramiden in 1998, the church hosting the recital, we're occasionally reminded, is once again the world's northernmost. 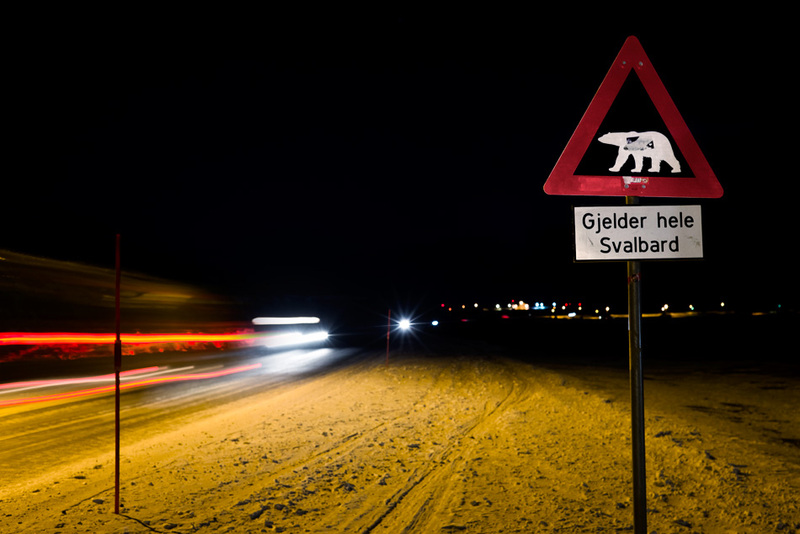 Carnivorous Triangle: Although Svalbard's difficult terrain makes it difficult to gather precise data, the archipelago's polar bear population is estimated at 3000-4000 individuals; in any case, higher than its human population. 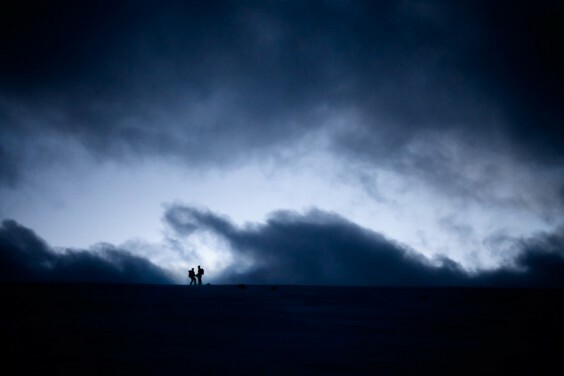 Unlike grizzly and black bears, the fast, agile polar bear shows little mercy with humans, and attacks, though exceedingly rare, are nevertheless the leading cause of death here. Tungsten Mountain Climbers: Residential buildings, a kindergarten and a sports hall sprawl along Longyearbyen's main avenue. 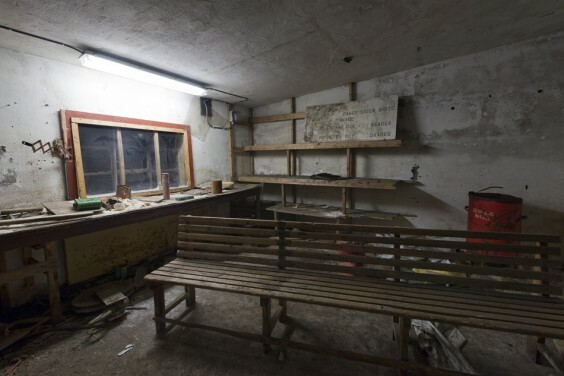 The town's other amenities include a well-stocked supermarket, several restaurants and pubs, a hospital, and a single-screen cinema that can seat 15% of the town's population at one time. 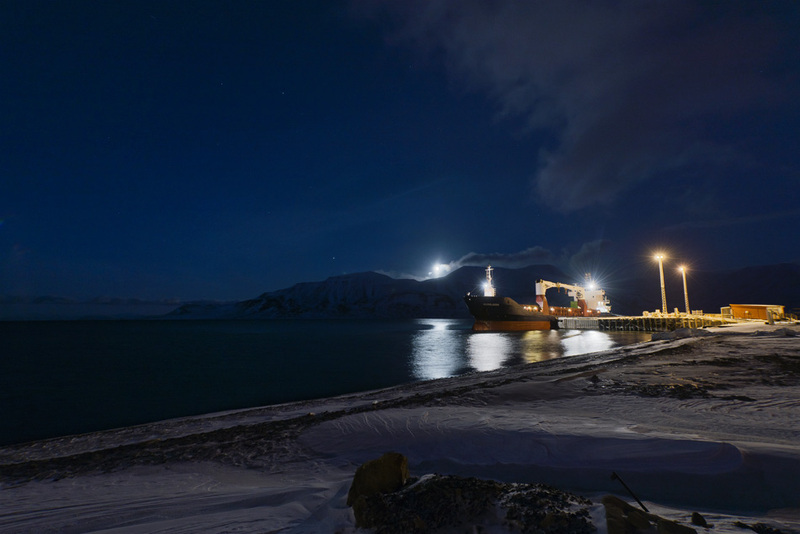 Port of Call: The Norwegian container ship Arctic Star unloads at the Port of Longyearbyen. 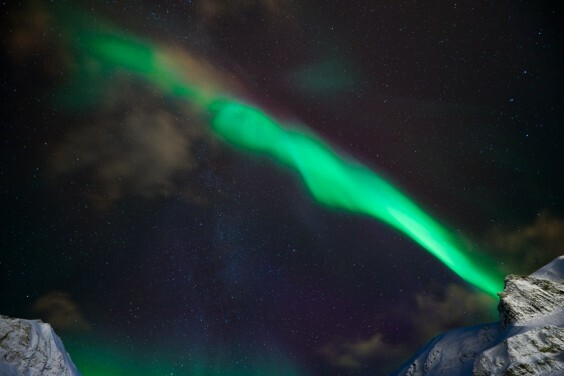 Apart from its maritime traffic, the island remains tethered to the mainland via a small airport that bounces a 737 back and forth several days a week to Tromsø, two hours to the south. 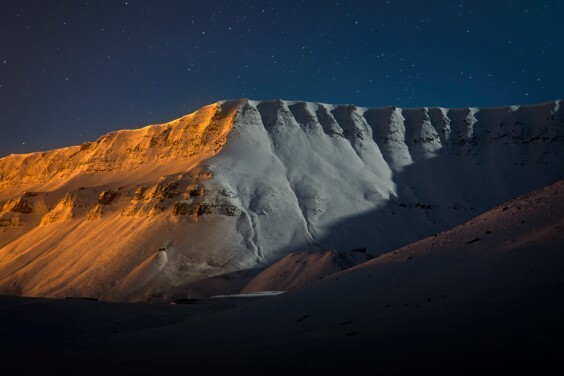 Embattled state-owned SAS, the only airline to serve Svalbard, nearly grounded its fleet in November, a move that prompted the local governor's office to issue a joint statement with the Norwegian Coast Guard to calm locals' fears that they would be cut off. 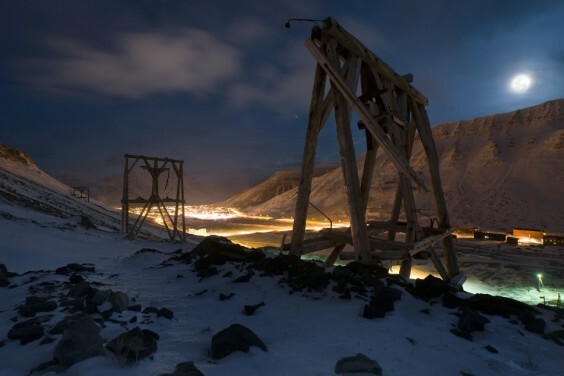 Trellisaze: Elaborate support structures made of wood shipped from the mainland -- the remnants of an aerial tramway once used to transport coal between Longyearbyen's long-shut mines and its port and power plant -- frame a view of town (centre-left) and Nybyen (right). Today, only Mine 7 in nearby Adventdalen, together with the company town of Svea and limited operations in the fast-evaporating Russian exclave of Barentsburg, offer material evidence to the industry that built today's Svalbard. Nightlocked: Crosses mark the gravesites of men and women who died in the early years of Longyearbyen. 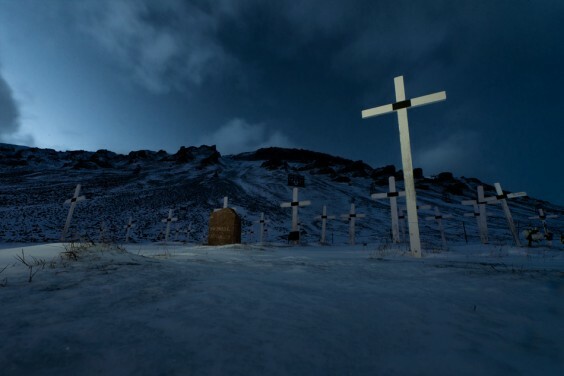 The cemetery has been closed to new burials since the 1930s, when it was found that the permafrost halted the natural decomposition of bodies. 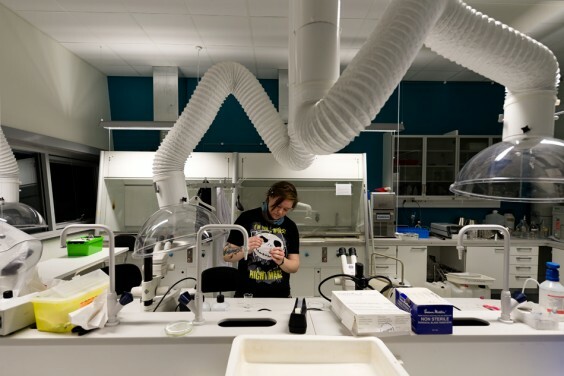 One body exhumed in the 1990s was found to possess a still-intact strain of Spanish Flu, the influenza pandemic that killed tens of thousands worldwide in 1918. Nowadays, no births or deaths are "permitted" on Svalbard; the pregnant or terminally ill are sent to the mainland instead. Supervised: An old headframe watches over Nybyen from the former Mine 2B, for decades Svalbard's highest-yield mine. 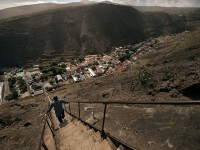 Perched high on the hillside above town, the mine was a strategic target of Axis shelling during World War II. 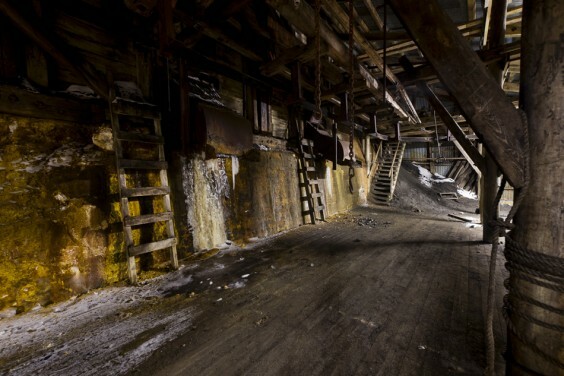 The last coal fire from the war was finally extinguished in 1962 and the mine was closed six years later. 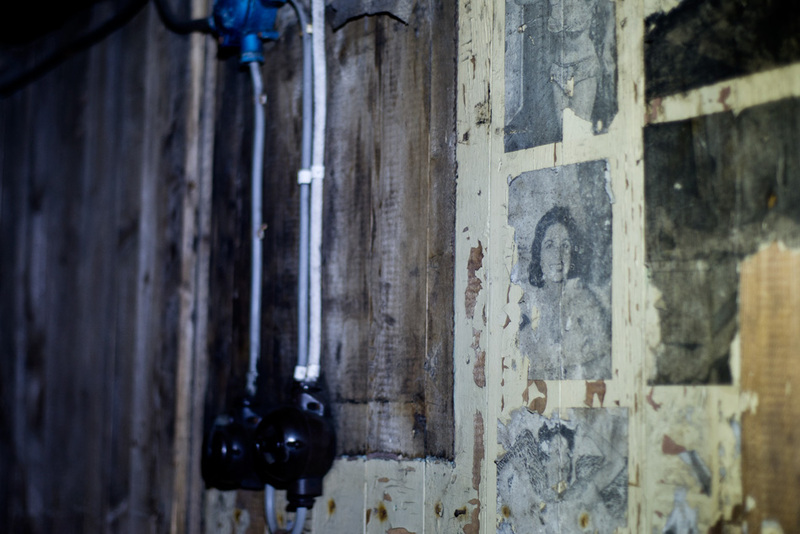 Icebound: Stalagmites and ice floes tear at the innards of Mine 2B. Implements: Sundry bits of machinery, their intended use no doubt lost on any who might visit them now, clutter the floors of former offices and store rooms inside the mine. Faded Beauty: Pornographic pin-ups adorn the walls of what may have once been a change room or supervisor's quarters. ...The Mine 2B Santa: Perched 200m above Longyearbyen and viewable from everywhere in the valley, the fairylit remnants of Mine 2B sub for Santa's workshop during the month of December. 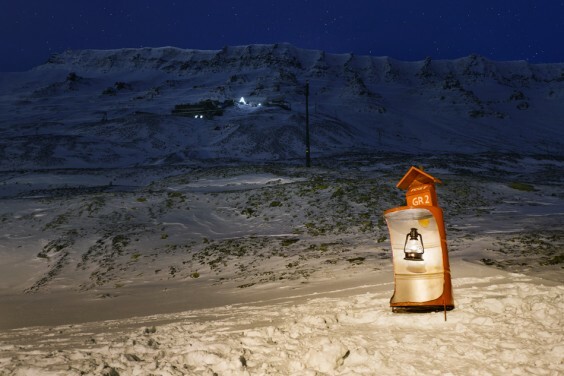 At the mountain's base, a lantern letterbox invites children and adults to leave correspondence for the hillside Santa. 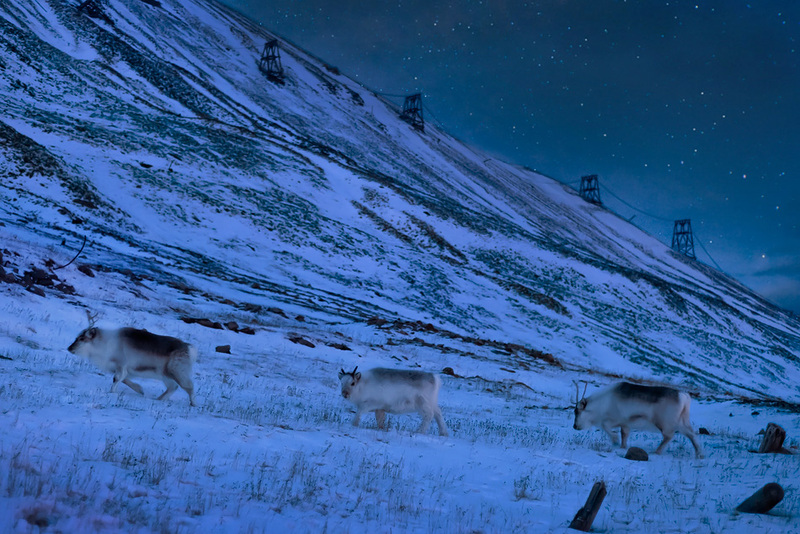 Towing the Line: Svalbard reindeer, a boxy subspecies endemic to the archipelago, graze on months-dead grasses. Since the hardy Scandinavian icon has no natural predator here -- they're capable of outrunning a polar bear in spite of their shorter-than-usual legs -- the Svalbard reindeer is as tame as cattle. 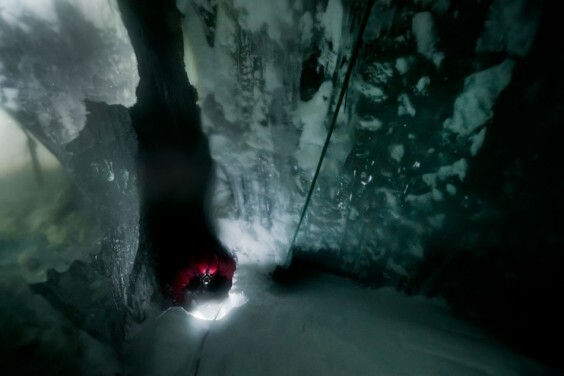 Ice Sarcophagus: Aided by crampons and an ice axe, UNIS student Tobias Vonnahm prepares to abseil into the inky black depths of a glacier cave underneath Lars glacier. 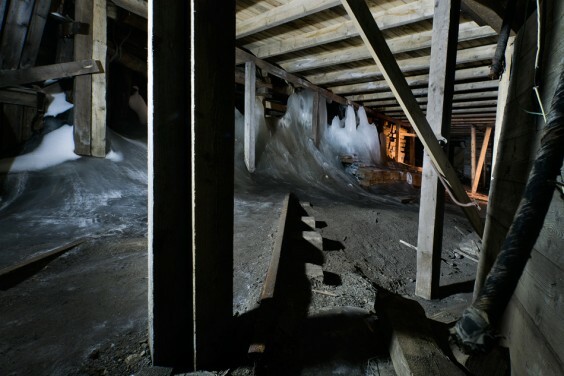 During summer, hidden channels of underground rivers allow water to drain from glaciers at their bases; frozen in winter, these honeycombed cave networks often extend for hundreds of metres in waterslide-like configurations. 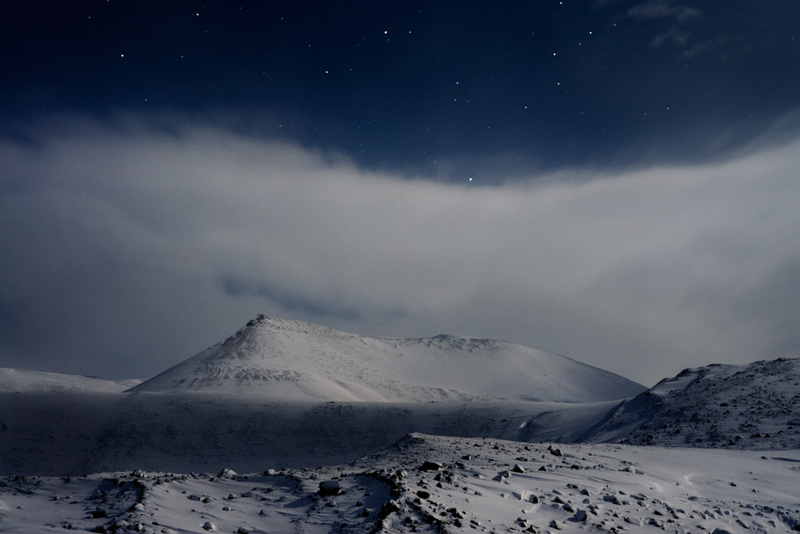 Skyplay: Its power neutered by the full moon, slivers of Aurora dance in Adventdalen. Peek-a-Moon: As if to compensate for the loss of sunlight, from mid-November the moon here never sets, instead tracing a funnel around the sky at a bearing that rises steadily with the days. 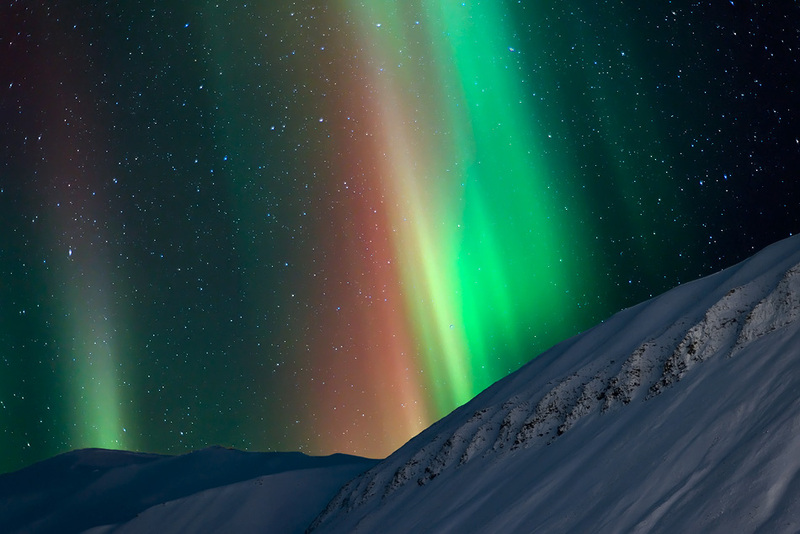 Trail of the Arctic Leprechaun: An auroral rainbow merges with Longyearbyen's omnipresent haze of light pollution. At 78° N, Svalbard falls to the north of the most auroral displays, which tend to cluster on a band around 66° N, and activity like this, in the northern half of the sky, is rare here.